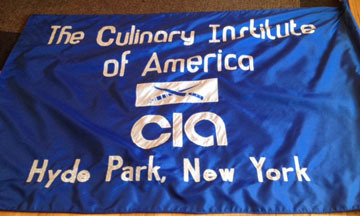 Attached are 2 pictures of the CIA flags we have. Essentially they are just our logos put on a flag pole. Unfortunately, no one here really knows about the history etc. Our school color used to be blue. It was then changed to green and gold. The logo has also evolved.